Apple Watch 4 vs Apple Watch 3: how does the new smartwatch compare? Apple just unveiled its new smartwatch and you&apos;ll be shocked to hear it&apos;s called the Apple Watch Series 4. As ever, there are some interesting features included here that may tempt you to upgrade and throughout this article we want to help you distinguish the key differences. Below you&apos;ll find everything that makes the Apple Watch 4 different to last year&apos;s Apple Watch 3. This is the biggest change we&apos;ve seen to the Apple Watch design since the first-gen was announced back in 2015. 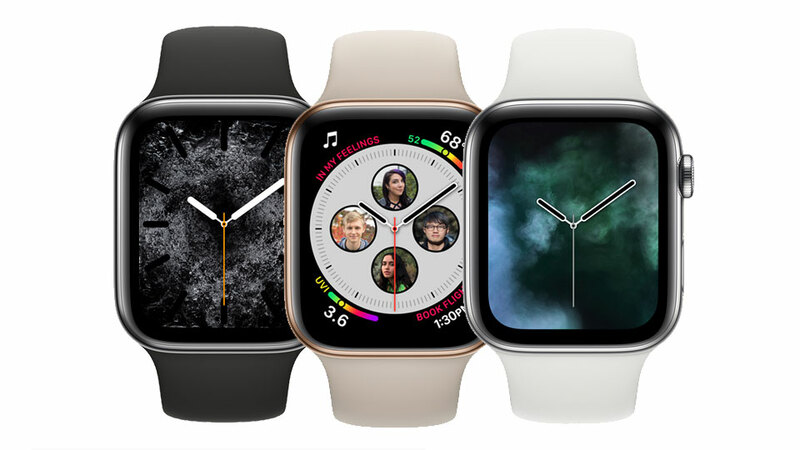 The now iconic square watch face design has returned for the newest product, but Apple has squeezed more display into the Watch 4. Whereas the Apple Watch 3 came in either 38mm or 42mm variants, the newer Apple Watch 4 is either 40mm or 44mm. It&apos;s only a touch bigger on these, but it allows for Apple to have 30% extra screen on this newer version of the Apple Watch. We think that&apos;ll make a bigger difference on the smaller version of the device. The bezels are thinner on the Apple Watch 4 and so are the screen curves around the edges of the display. While we don&apos;t know the exact size of the screen, it looks to be notably larger than the Apple Watch 3 when navigating around the watch. This should offer lots more space for navigating around app, but that doesn&apos;t make the display tech on the Apple Watch 3 obsolete. We don&apos;t currently know much about the exact dimensions of the Apple Watch 4, but you can expect it to sit larger on your wrist. We&apos;ll be sure to update this versus once we know more about the size and weight. You can buy each device in aluminum in silver, space grey and gold colors, while the same color versions are also available for both watches. Any straps you already own for Apple watches will work on both generations of the device. 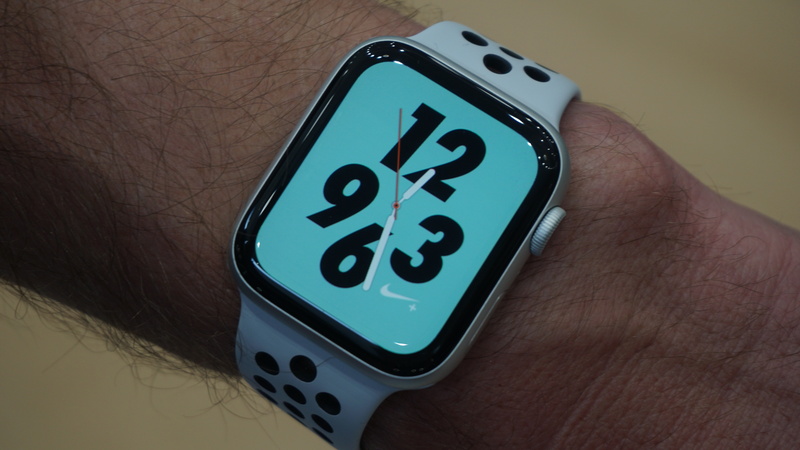 The Apple Watch 4 comes running watchOS 5 software out of the box and those with Apple Watch 3&apos;s will be able to upgrade to it later in September, so you&apos;ll soon have the latest version of the software no matter what watch you opt for. It&apos;s one of the best versions of a software on a smartwatch, and you&apos;ll be able to get all the benefits of the new third-party complications on watch faces as well. The Apple Watch 4 has a faster processor than the Watch 3 called the S4 which the company claims will be twice as fast as the last generation. Whether you&apos;ll notice that performance bump in real-life usage is unclear, but if you want the fastest Apple Watch, you&apos;ll need the newer version. 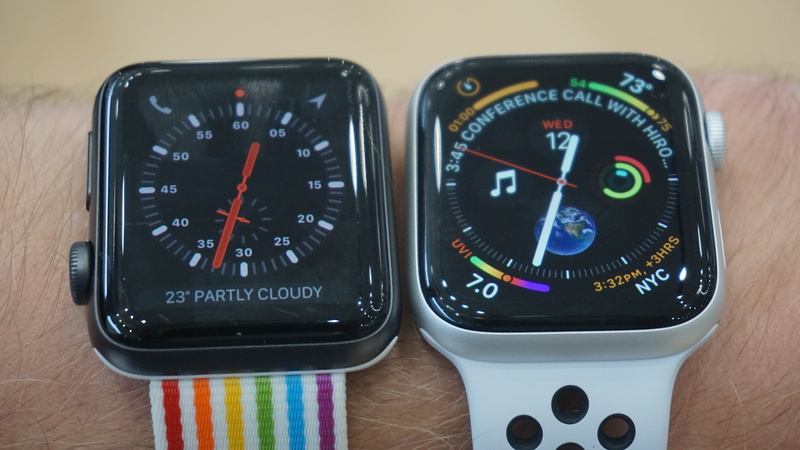 Both watches will be capable of a cellular connection - if you buy the more expensive model - but you will want the Apple Watch 4 for the stronger connection. The rear is made of a ceramic this time that allows for a better connection, according to Apple. How particularly well this will work, we won&apos;t know until the time of our full review soon. One of the biggest new features is the fact the Apple Watch 4 can take an ECG reading. That&apos;s to do with your heart health, and while it may not be relevant to everyone it&apos;s a groundbreaking upgrade for those with poorer heart health. There&apos;s also a new feature that uses a new type of accelerometer to track if you&apos;ve had a fall and then call the emergency services. This could be particularly useful for the elderly. The Apple Watch 4 offers most of the same fitness features we saw on the Apple Watch 3 including GPS tracking, a top-end heart rate monitor, a waterproof design and sleep tracking tech. Everything you&apos;re used to on the Apple Watch 3 will be available here, so you&apos;re only going to get more features if you opt for the more recently announced watch from Apple. When it comes to battery, Apple claims you&apos;ll get a full day of usage from both watches. We found to be the case with the Apple Watch 3, but we cannot yet attest the same claim for the Watch 4 yet. Apple also said the Watch 4 will be able to track outdoor activity - through use of a built-in GPS sensor - for up to six hours from a single charge, which is an upgrade over the last generation. Here&apos;s where the Apple Watch 3 comes into its own. As it&apos;s a year older it&apos;s significantly cheaper, and the launch of the Apple Watch 4 has pushed down its price too. It&apos;s now $279 / £279 / AU$399 for the Apple Watch 3. The Apple Watch 4 starts at $399 / £399 / AU$599, so it&apos;s significantly more expensive, and both of these sets of prices are only for the GPS versions of the watch. That said, there&apos;s a lot of new tech in here and it&apos;s similar to the price of the Apple Watch 3 when it was first announced last year, around this same time. Although the Apple Watch 4 isn&apos;t going to change everything about the company&apos;s wearable game, there are some solid upgrades here that you&apos;ll likely be impressed by. You probably don&apos;t need to upgrade to this if you own an Apple Watch Series 2 or 3 (unless you want the ECG features) but the slight redesign is a big improvement and there are lots of reasons to buy the latest over the Watch 3. That price of the Apple Watch 3 is much more attractive, but if you want longevity, the better design and the extra features you&apos;ll have to spend a little bit more and opt for the Apple Watch 4.